FUKUSHIMA NEW CLEAR MAKINA LIVE! Do not miss this semi-LIVE gig. FUKUSHIMA NEW CLEAR MAKINA. Japanese nuclear radiation, LIVE, on the guitar. Social celebration. Deep, Cosmic, Italo Disco… She’s back at the request of the audience. Selected garments of some reasonable standard. Find brands such as Max Mara, Gucci, Carvela, Alexander McQueen, D&G, Bimba & Lola, Kickers, Pepa loves, amongst others. April 22, 2013. Tags: AAVIB, Accessories, Bautista, Clothes, Cultural Activities, DJ, fix ibiza, Fukushima, Japanese, Le Fleur, market, Mr Wheel, music, Onigiri, Sa Drassaneta, sushi, Sushiya Aoyama, WABIZA, Workshops, Yakisoba. Uncategorized. Leave a comment. 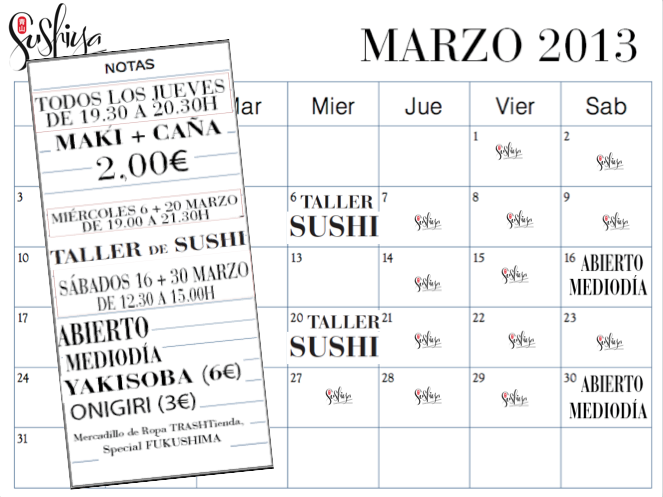 Open Lunch Time Saturdays 16th and 30th of March Sushiya Aoyama will open also at lunch time (12.30-2.30pm), with special dishes of Yakisoba (6€) and Onigiri (3€). As well there is an addition, of a clothes and accessories market: Trash-Tienda, plus LeFlear DJ will be on the decks to help warm up the event. Also on the 16th we will be fundraising for Fukushima. Also open on the 27th March! February 13, 2013. 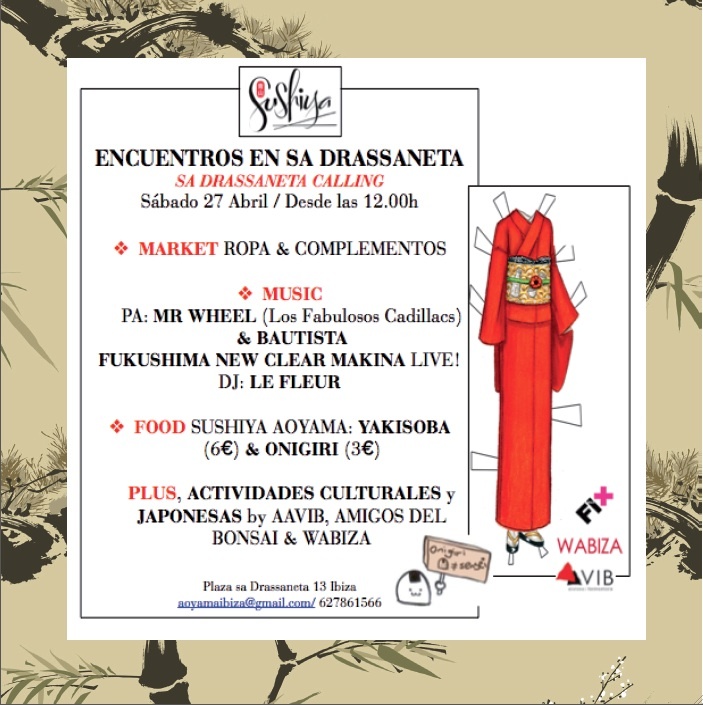 Tags: Accessories, Clothes, DJ, events, fix, Fukushima, fundraiser, Happy Hour, ibiza, LeFlear, Maki, March, market, Onigiri, Re-opens, sushi, Sushiya Aoyama, Trash-Tienda, Workshops, Yakisoba. Uncategorized. Leave a comment.